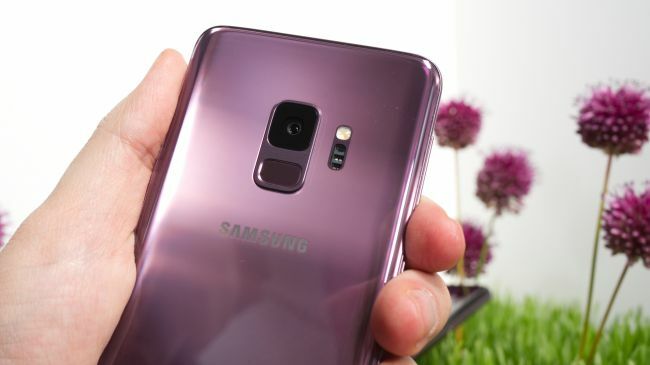 Galaxy S9 is officially introduced by the South Korean company-Samsung, with the main focus on an impressive camera, though there is not too much difference in design comparing to Galaxy S8. Looking at the front of two devices, you may find them difficult to distinguish, but in fact, S9 is still a worthy & excellent smartphone. In this post today, let’s take a quick look at the new Samsung Galaxy S9 smartphone. Generally, the Samsung Galaxy S9 doesn’t look too different to its predecessor, Samsung Galaxy S8. However, have a closer look, you will notice that the above and below bezels of the display have already been trimmed down slightly to reduce the overall height of the new S9. Although Samsung has changed a little the width and thickness of Galaxy S9 as it is measured at 147.7 x 68.7 x 8.5mm, it’s still comfortable when holding in the hand. Galaxy S9 is heavier than the S8 (168g vs 155g), but it’s lighter than iPhone X (174g). Samsung has hidden the Iris scanner hole in the bezel to remove the boundaries between screen and bezel, as well as minimize the visual elements for a cleaner to get the minimalist appearance. On the right side covered by a metal frame, we can find the Power button, while on the left side, there are volume rocker and the Bixby button sticking with its assistant shortcut key. A new positive design comes from the location of the fingerprint scanner. Many users felt inconvenient with the placement of the fingerprint reader on the Galaxy S8, S8 Plus and even Note 8, and the good news is when Samsung has heard from users. It’s now moved to below the rear camera, which is more convenient for unlocking action. If the new fingerprint scanner is not your liking, the Galaxy S9 also comes with the improved facial and iris recognition. The new face and eye scanners offer a quicker unlock time even when you are in the dark. 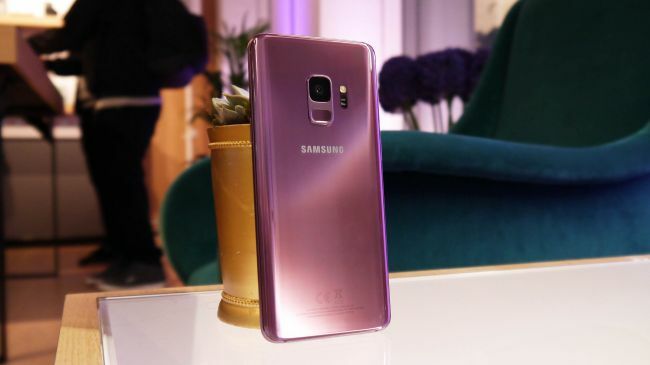 The Samsung Galaxy S9 is available in three color options, including midnight black, coral blue, and new lilac pink. There is also a titanium grey color, but this is only in selected markets. There are no surprises as the display on the Samsung Galaxy S9 is similar to the screen on the S8. You still get a 5.8-inch QHD+ Samsung’s eye-popping Super AMOLED display with the 18.5:9 aspect ratio, which is becoming the trend on smartphones from 2017. The device also features the Infinity Display, making sure 90% of the front is the screen, coming with the less bezel than on its predecessor for the better viewing experience. The curved edges of the screen bring you the great experience when watching movies or playing games. 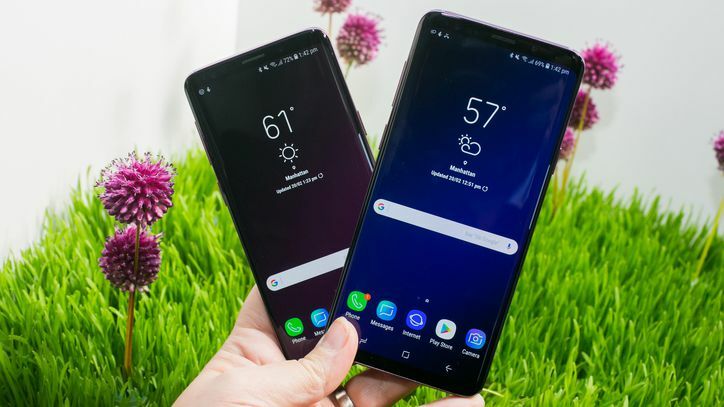 With its Galaxy S9, Samsung has brought a better experience in landscape mode, and the user interface can now rotate to fit the widescreen layout. The big impressive point on the Samsung Galaxy S9 is its main camera, with an f1.5 12MP snapper. It is equipped the new dual-aperture technology, which allows the camera aperture to expand and contract to fit with the light level. The slow-motion video capture is also improved as the camera supports the frame rate up to 960fps to compete with other products from Sony such as Xperia XZ1, XZS or the new XZ2. It also to record the slow-motion video at 960fps at 720p, while the video resolution for 240fps slo-mo is grabbed at Full HD. Another smart feature included in the new S9 camera is the Motion Detection function. All you need holding it up to the space that you want to film without having to press the shutter key. AR Emoji is also a new great feature on Samsung Galaxy S9. It’s quite similar to the Animoji on the iPhone X, but AR Emoji on the Galaxy S9 can do things differently by snapping your selfie to create a 3D animated character. You can freely choose your hairstyle, clothing for your AR Emoji, but the options are currently limited to 12 outfits and 7 types of spectacles. Although it’s a bit of fun, there are not too many offers to try. Those who are expecting an improvement in battery life on the Samsung Galaxy S9, you might be hopeless. The company has equipped a 3,000mAh battery on Galaxy S9, which is the same as S8. It’s not a bad battery capacity, as the Galaxy S8 could last for a whole day with a single charge. Moreover, there is also an upgrade in the processor by packing the in-house developed Exynos 9810 chipset (apart from the US). The US variant of the Galaxy S9 will come equipped the Qualcomm’s latest Snapdragon 845 SoC to make sure it supports all US major networks. Both of them are paired with 4GB of RAM, which is 2GB less than the S9 Plus version, but running the Android 8 Oreo smoothly with 4GB is not a difficulty. The Galaxy S9 will run on the latest Samsung UI Experience 9.0 based on Android Oreo version, which is expected to bring a lighter and smoother interface. The Samsung Galaxy S9 will be officially released on March 16 globally, but you can now make the pre-orders the handset if you’re in Europe. If you’re in the US, you will then need to wait a little longer as the pre-orders will begin on March 2. The pricing of Samsung Galaxy S9 price in UK will start at £739 ($719.99, around AU$1,199), which is a little more expensive than its predecessor, Galaxy S8.